Disk PLUS is a very comprehensive multipurpose disk utility that can be used as both a disk cleaner and a space recovery tool. As a disk cleaner, it detects junk data from various hard to detect locations regularly cleaning which will keep your Mac optimized and in good condition. As a space recovery tool, it is often capable of reclaiming several Gigabytes of valuable disk space. 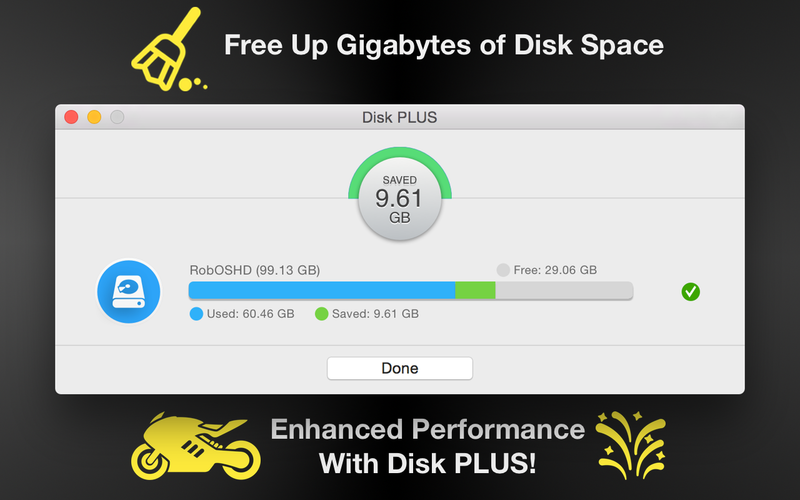 A unique feature of Disk PLUS is its ability to recover space from ANY partition on ANY drive including external drives such as thumb drives. 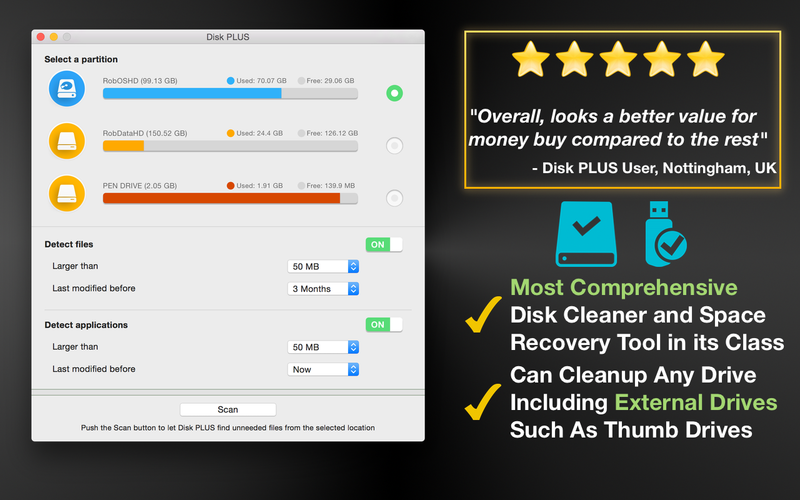 Disk PLUS is comprehensive, intelligent, intuitive, and extremely safe use. The data to be cleaned up is neatly divided into two parts - “Safe To Delete” and “Review And Delete”. The “Safe To Delete” section normally contains data that is junk and can be safely cleaned up to recover large amounts of disk space. Cleaning some of these such as Application Caches and Logs, Trash etc. will also improve your system’s performance. This is the section that you will be cleaning again and again to keep your system clean and optimized. The “Review and Delete” section contains items that require you to take an informed decision and hence are turned off by default for better safety. You will be deleting the stuff in this section only when you really run out of space on a particular partition. How intelligent is Disk PLUS? 1. 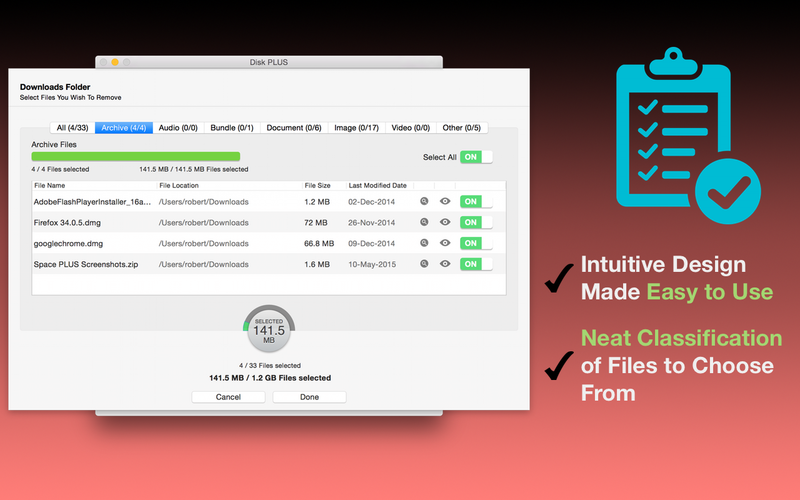 Disk PLUS knows that removing an application is different from removing an ordinary file. Applications are not isolated files - they often have other related files and folders lying around in the system. Disk PLUS is smart enough to detect and group these by the Application to which they belong so that you can easily review them for removal. 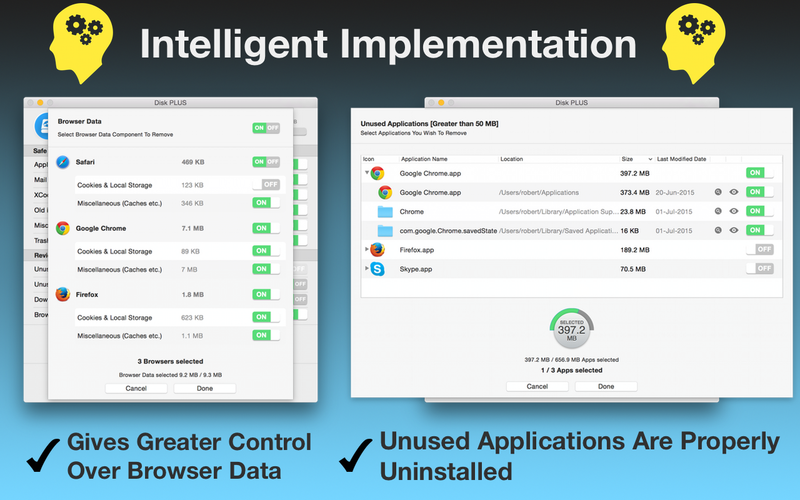 Thus Disk PLUS helps in completely uninstalling large unused applications rather than simply removing the application alone. 2. When cleaning Browser Data, safe to remove items like local Caches are separated out from Cookies (including Local Storage). This is particularly useful since most users like to retain their browser cookies while choosing to delete the rest of the browser data. Disk PLUS is sandboxed for enhanced security and hence only detects and cleans data it is permitted to remove. Disk PLUS is actively developed and maintained. We also provide excellent customer support powered by Zendesk. Last but not the least, if you like the product, please leave a review on the app store - it will really help us. If you face any issues or have any feedback, then please contact us at diskplus-support@solutionshare.zendesk.com. We wish your data drives a long, happy and spacious life! Copyright © 2018 SolutionShare Technologies Private Limited. All rights reserved.